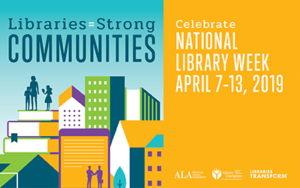 In light of this special week emphasizing “strong communities” the APRL has taken to social media and throughout the week will provide a deeper glimpse into the library, the staff, our resources (both here and outside of the APRL), the services we provide, as well as a look back at our past and a look ahead to what the future holds. Some highlights in the social media posts this week will be an introduction of the APRL staff with some sharing their favorite tips for using and getting the most out of the library and its resources; an introduction to our other philatelic library partners including the Global Philatelic Library; some unique resources found in the APRL collection and little known services we provide; and finally, a look at our newest resource and service, the APRL Digital library. Today’s post is a brief description of the APRL, its resources and services, which has grown considerably since its modern day inception in 1967. Today we have roughly 90,000 items in the collection which constitute about four linear miles of material. The collection includes books, journals, auction catalogs, stamp catalogs both general and specialized, name sales, government documents (Postmaster General Reports, Postal Guides, etc. ), domestic and international stamp show programs, stamp albums, as well as a number of special collections and archival items (https://classic.stamps.org/Library-Collections). 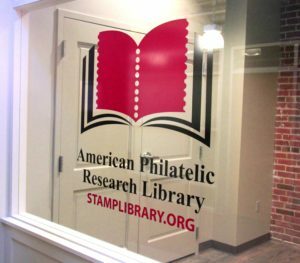 The APRL is the largest public philatelic library collection in the world. Along with these resources we have a number of services that we provide to both of our “communities,” APS members and non-members. We receive requests from the philatelic community in the form of e-mails, phone calls and even letters as well as in-person requests. 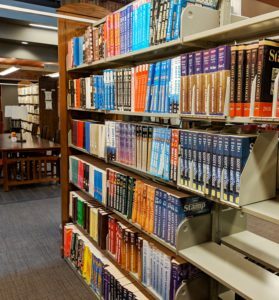 Requests can include the borrowing of most library materials sent through the mail (APS members only) including the borrowing of books, journals, auction catalogs and name sales; scans or photocopies of requested materials sent by email or regular mail respectively; as well as research for questions big and small. There is a small fee (https://classic.stamps.org/Library-Services) for most of these services, but in some cases for smaller requests there is no fee. Contact the APRL today if you have a request or questions about any of these resources or services by emailing us (library@stamps.org) or calling the library. Coming up later this week as we celebrate the days of National Library Week, we will have a book giveaway. Stay tuned for details!